On the heels of November’s presidential election, the conversation on immigration reform has changed dramatically and for the better. Pundits on both sides of the aisle pointed to the power of the Latino vote as a key driver in the Democratic victory. Seventy-one percent of Latinos supported the president. But it’s worth repeating that it is not simply Latino voters who support immigration reform, but also the American public as a whole. Poll after poll shows that the American people believe immigration reform should first and foremost provide a pathway to citizenship for the 11.1 million undocumented immigrants living in the country. Here is a roundup of the most important national immigration polls from the past few months. CBS News published a national poll on December 18 illustrating that the American public wants to see a pathway to citizenship in any immigration reform bill, rather than a policy that simply grants undocumented immigrants legal status with no recourse to ever become a citizen. 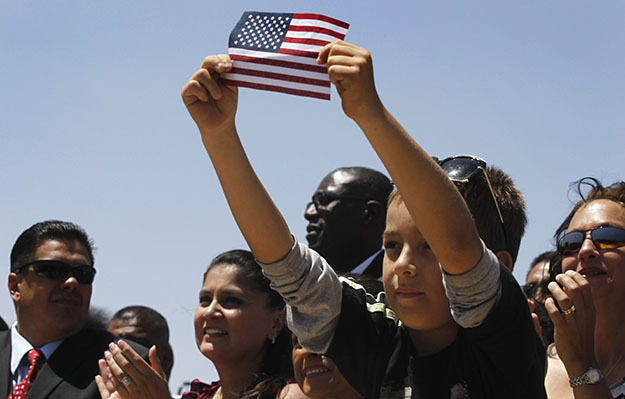 In total, 47 percent of Americans stated that the unauthorized should be allowed to stay in the country and “eventually apply for U.S. citizenship.” Only 24 percent believe these immigrants should be allowed to stay as guest workers with no path to citizenship, and only 27 percent agree that these immigrants should be required to leave the country entirely. These figures show an upward movement toward a path to citizenship from mid-June, when a New York Times/CBS News poll found after asking the same question that 43 percent of Americans supported the pathway and 32 percent of Americans believed that undocumented immigrants should have to leave the country. Bloomberg News released a national poll on December 11 showing that a majority of Americans—57 percent—believed that the president’s re-election shows that he has a mandate to “overhaul immigration law to provide a path to legal status.” Only 38 percent disagreed. These findings are important not simply because the American people believe that immigration reform should occur in the president’s second term, but because they specifically believe that the election has provided a mandate for the administration to pass a reform bill. In a postelection poll conducted by ABC News and The Washington Post, 57 percent of Americans stated that they support a pathway to citizenship for undocumented immigrants, while only 39 percent were opposed. Even more importantly, as the immigration advocacy group America’s Voice pointed out, younger voters were particularly in favor of a pathway, with 65 percent of 18- to 39-year-olds in favor of and only 31 percent against it. In exit polling completed on election day, close to two-thirds of all Americans—65 percent—told pollsters that undocumented immigrants in the United States should be “offered a chance to apply for legal status,” while only 28 percent argued that they should be deported to the country they came from. In a poll released just before the election, CNN found that the majority of Americans—56 percent—believed that the “main focus” of the next administration’s role in immigration policy should be “a plan to help [undocumented immigrants] become legal residents,” while only 39 percent believed that the United States should first work to either stop unauthorized entry or deport undocumented immigrants already living in the United States. In a national poll released in mid-June, Gallup found that the majority of Americans—55 percent—felt that the top priority of immigration policy should be dealing with the undocumented immigrants living in the United States. Only 41 percent, in contrast, believed that halting the flow of undocumented immigrants should be the top priority. These results represent a complete reversal from just last year, when 55 percent of Americans believed halting undocumented immigration should be the first priority, and only 43 percent stated that the United States should first deal with its undocumented immigrants. As we move into the new year and toward the introduction of a comprehensive immigration reform bill in Congress, members from both parties would be wise to heed the wishes of the American public by putting a pathway to citizenship front and center in any proposed bill. The election has come and gone, migration from Mexico is declining, and the border with Mexico is “safer than ever.” It’s time to deal with the 11 million. Philip E. Wolgin is an Immigration Policy Analyst at the Center for American Progress. Angela Maria Kelley is Vice President for Immigration Policy and Advocacy at the Center.